This disc has only the "ring of dashes", and not the "MADE BY 3M USA" mint markings normally seen on 3M products. 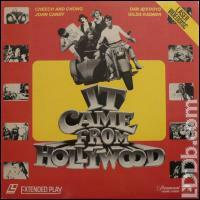 Original LaserDisc and CED release is the only issue of this film on disc due to the numerous rights issues involved with the various film clips used. Film was announced for DVD release in 2002 but then cancelled when rights could not be obtained and Paramount now claims rights clearances are impossible. This film was one of the titles that Paramount had pressed at 3M when 3M entered the consumer disc business and offered special pressing rates to try them out - at the time 3M offered better quality than Pioneer US or Japan although they could not press CAA Extended Play titles, only CLV. Paramount had about 8 titles pressed by 3M and never used them again.